This year’s theme is identity. Come discover who you are and whose you are! Virtues: What are they? How can you grow in virtue? Do they really apply to your life? Saints: Why do the lives of a bunch of dead people really matter to the Church? Theology of the Body: Reflect upon and discuss aspects of Pope St. John Paul II’s integrated vision of the human person. How to pray: How can you pray with Scripture? What is Adoration? How do we pray for others? Middle School Youth Group meets from 6:30 – 8 pm on Wednesday evenings in the parish hall basement. and having a bunch of fun! 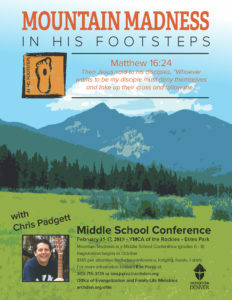 If you are a Middle School Student in grades 6-8 we would love to have you join us! High School Youth Group meets from 6:30 – 8 pm on Wednesday nights in the parish hall basement. This is a time for growing in our relationship with the Lord and with one another. growing in friendship, playing games and enjoying highly caffeinated and sugary snacks! If you are a teen in grades 9-12, we’d love to have you join us!